Pictured (left to right): Drs. Carlos Risco, Martin Furr, Ashish Ranjan, Melanie Boileau, Shane Lyon and Margi Gilmour. 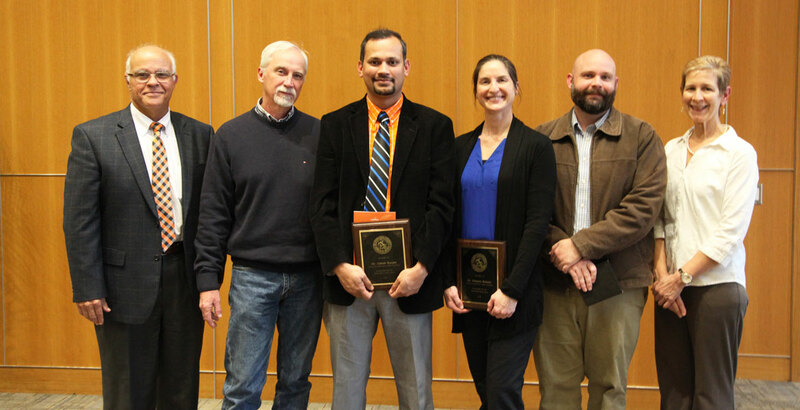 Congratulations to the Oklahoma State University Center for Veterinary Health Sciences faculty members who were recognized for their accomplishments during the University Awards Convocation held on December 4, 2018. Dr. Melanie Boileau received a Regents Distinguished Teaching Award for her commitment and achievement in the instruction of veterinary students for more than 16 years. To read more about her accomplishments and love of teaching, visit Boileau Named 2018 Regents Distinguished Teacher. Dr. Shane Lyon received an Advising Excellence Award for providing outstanding academic advisement to veterinary students. Dr. Lyon is an assistant professor of small animal internal medicine in the Department of Veterinary Clinical Sciences and a diplomate of the American College of Veterinary Internal Medicine specializing in small animal internal medicine. Dr. Ashish Ranjan received a Regents Distinguished Research Award and the Distinguished Early Career Faculty Award. Both awards recognize Dr. Ranjan’s contributions to the University and to his profession. Dr. Ranjan is an associate professor in the Department of Physiological Sciences. Read more about how his research is helping animals and humans at Changing Lives One Research Project at a Time.